To add to the tracking apps and smart bands already on the market to help parents keep an eye on their kids even when they're out of sight, now there are smart sneakers. CNET's Rich Trenholm checked out the MediaTek 361 smart shoes at the Mobile World Congress in Barcelona this week. With tech from Taiwanese chipmaker MediaTek and shoes from a Chinese manufacturer called 361, the colorful kicks have a microprocessor and GPS chip embedded in the heel, which beam geolocation data to an app on your smartphone. The chip doesn't use a lot of juice, so the battery will last a day or two. But when the shoes need to be recharged, it can be done wirelessly, with an induction charging pad that acts as a home base for the pair. As with other tracking technologies, the shoes come with their own set of questions and quandaries about privacy and hacking. As Trenholm wrote, "Parents face a uniquely modern dilemma: would you rather face the risks of not knowing where your kids are, or the risk that others may be able to access that data too?" This is one of the many enduring questions that comes up as we give kids cellphones and start watching their every move with our own. But the shoes do answer one question that other tracking devices don't, which is how to make sure children keep the GPS chip on them at all times. It can be easy to lose a phone or a wristband, but even the most forgetful child is probably not going to go running off without his sneakers. 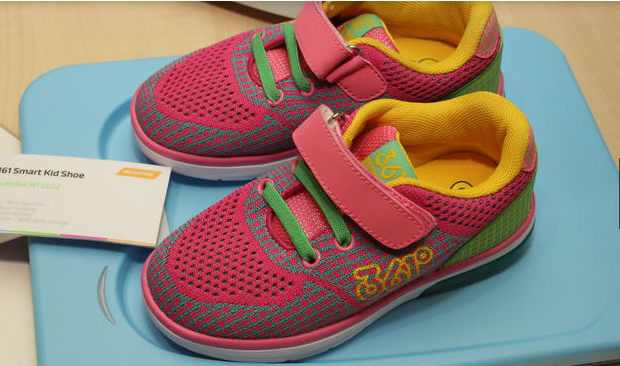 The shoes will go on sale in China next month for 500 yuan ($80).